My Penultimate “organised” race of the year took a distinctly festive tone. 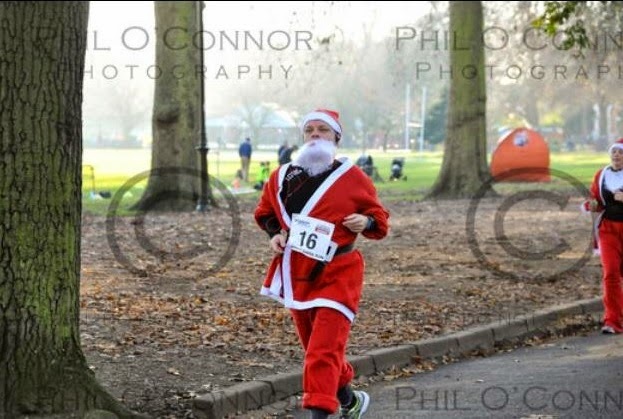 I have never raced in costume despite considering the gorilla run across Tower Bridge and Santa Runs last year. This was the first year I actually made the effort and bit the candy cane bullet. 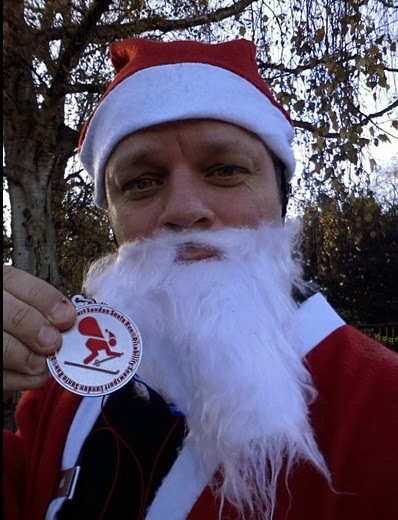 It was my 29th race of 2014 and my 31st piece of bling would be awarded for the Santa Run Battersea for Disability Snowsport UK, a charity with adaptive ski schools throughout the UK that promotes snow sports for all disabled people. 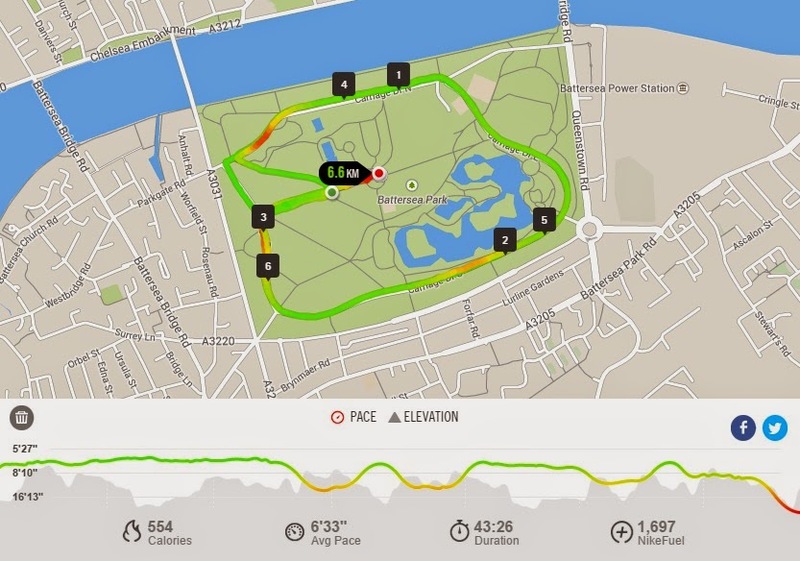 It was a 6K run twice around a park that I ran at only a month before for the Movember 5K so it was very familiar to me. It was a chilly one but was organised to start at a very reasonable 10am so I got out at Westminster and walked along the water as my warm up. 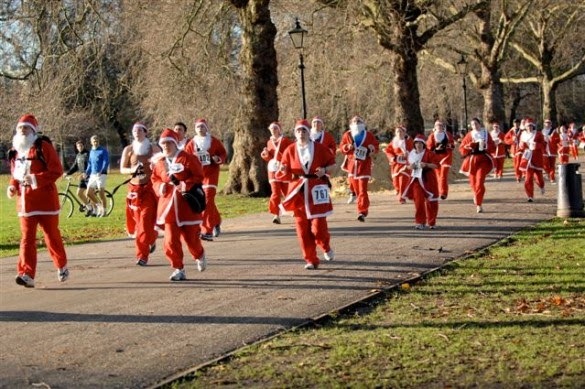 You picked up the costume at the athletic club and it was real sight seeing hundreds of runners changing into Santa costumes in the cold. Quite surreal really. The costume was dubbed as a “one size fits all” deal but let me tell you, one size does not fit all, not even close. The trouser legs were probably 35 inches long and had a draw string that did not really help in keeping them up. I am conservatively guessing that someone with a 50 inch waist would consider them the snuggest trousers they have ever owned. For me, I had to roll the legs up from the off. As the draw string didn’t seem to work for me I had a bit of a brainwave. I pulled the trousers up and pinned them with the safety pins that I used for my race number. So the pins went through the bib, the tunic and into the trousers. Brilliant I thought, but the pins were pretty weak and broke, meaning from midway through lap 1 I was running holding my trousers up. Twice around the Park, a nice easy 6K on the perfect tarmac. The costume really was the problem here. The beard in the mouth, head dripping with sweat from the hat and red suit not adhering well to the under armour I was wearing and therefore slipping off in every direction. 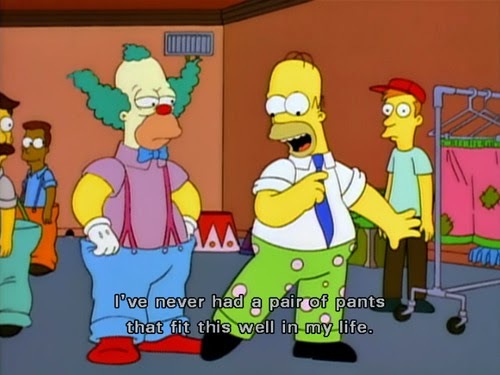 Having to hold the trousers up was a bit of a nightmare and I had to stop several times to fight with the costume. Someone did have enough and step out of the trousers and keep on running without them but I had compression leggings on and no shorts and that would not have looked pleasant at all. This was a charity run. It was a fun run. There were children running, people with strollers running, people with dogs running. And my time was therefore just OK. I know the costume killed me but here is how I did. 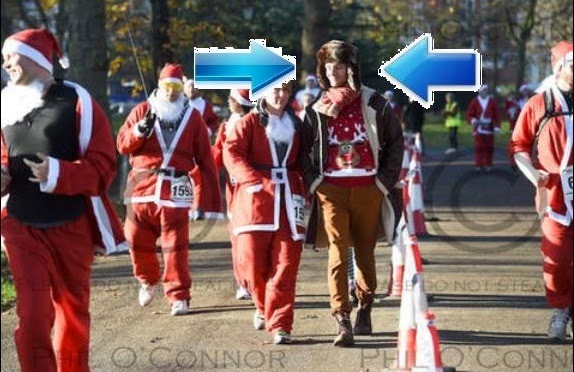 He was not running, he was not taking part, but he strolled onto the course and got in the way of those running to the finish, oblivious to the fact he was being a complete tool. We asked him to get out the way but with his stupid hat and slow swagger he ignored us. It was so bad that I reached ten yards from the finish with others only for us to have to stop and walk over the line after him because he was so obstructive. It annoyed me so much I forgot to stop my Nike+ too, so there is a 400 foot red stripe at the end where I was walking and scowling before I realised.But whatever, guess you can’t have everything. I really enjoyed the experience… no, scratch that, with the costume, and the tool, I did not enjoy the experience, but I liked the atmosphere and next time I will be ready. 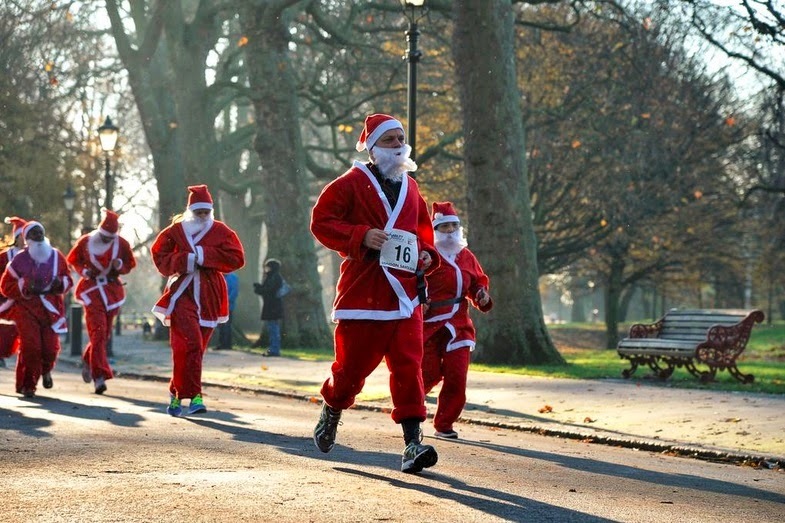 Another Xmas race on the 21st, but no costume for that. Wasn’t too bad, was bespoke which was good, but did not detail the year of the event, just the charity. Better than a standard Xmas themed medal. Would I run it again? Probably. How would I do it differently? I would take a pair of scissors and remove the arms and legs off the suit, and and maybe some festive braces to keep the trousers up.